Central: T. Schiller 30, Hoskin 22, F. Fort 21, D. Fort 19, Dew 16, Presbury 15, Hanna 14. Norwood: Glenn 8, Grigg 4, Hamilton 3, Dawe 2, Abbott, L. Johnston, Jefferies, Panos, Smart, Carter. Central: McKenzie 3, Hoskin 2, Butcher, Jenner. In an absolute cliffhanger Centrals 7-11-53 held off the fast finishing Josh Glenn FC 8-0-48. Now, in all seriousness it was a masterclass performance by Josh Glenn in how to play against your old side, ignoring any crap and being in complete control with disciplined aggression and immense skill and Glenn certainly kicked a hell of a lot straighter. The night began with McKenzie from the Dogs kicking the first goal of the game, but then the Redlegs took complete control, kicking eight of the next nine goals with elite, very quick ball movement. Matty Panos dominated the first stanza, Matt Nunn and Ed Smart’s pace was prominent while Declan Hamilton, with some classy finishing ended up with three goals for the quarter. Central District dominated inside 50s at the start of the second quarter but very good defensive structure held the Dogs at bay, an area in which the Legs have improved in dramatically over the last few weeks, and needed to, Mitch Wilkins returning has helped. The quarter was virtually even Stevens with the Legs kicking 2-3 to 1-5, the game was over effectively as a contest at half time, the Dogs’ poor finishing not enabling them to build any scoreboard pressure on the Legs at all. A very entertaining mayor’s parlour function at half time meant I was a tad late back into our seats and missed Josh Glenn’s early goal, hope to see the replay (good luck in the World Cup Brent Felica). The night as a Norwood supporter continued to be very enjoyable, inspector gadget arms Brady Dawe took some great grabs and kicked a couple of goals. Mitch Grigg destroyed his tagger and was conspicuous on the scoreboard as well. Will Abbott, after winning the most prestigious award in world sport, the FA Bloch Medal https://www.footyalmanac.com.au/chocka-bloch/ playing for Iggys in Div 2 last season in SAAFL community footy has performed more than creditably at league level, his toughness at every contest is a joy to watch. The last quarter became the Josh Glenn highlights reel show kicking 4 goals (poor timekeeping another minute or so and Josh would have knocked the dogs off). Ben Jefferies performed his role, it really was close to the old school line all played well for the Legs, for the Dogs it was a lot harder to find good players, Travis Schiller worked very hard as usual and found plenty of the footy, Josh Hoskin and the Fort brothers tried hard. So the Redlegs now have a bye before facing West Adelaide, while the Dogs face the Power reserves next week. Another good win to our Norwood Football Club Reserves men as well. Summed it up perfectly Rulebook. Abbott’s work off the ball is exceptional. Fast becoming a fan favourite!! I guess the only criticism, is the squaring kick across half back (or even half forward), that just doesn’t work, and often gets picked off by the opposition, who then stream in for an open goal, as Centrals did for their first. As a team, they look much better moving the ball forward, even if it’s a soccer of the ground, as they did a few times to good effect. And ditto for the Reserves. I thought they’d been sucked in by Centrals, gifting them that double goal. But the lads then put the foot down and just ran all over them. Great write up again Malcolm. That game was excellent, our guys played well. Josh Glenn played well against his old side, just wonderful. Matt Panos was great, and Mitch Grigg, is still a star. An outstanding win by Norwood over the Dogs at the Parade. Breaking 3 straight wins by the Dogs at Norwood, it was great to see the tables turned. Norwood played well all night and after smashing the Eagles away, they are looking really good. It was a very good night overall at the Parade. Two winnable games away to West and home to Glenelg look like % boosters inbetween 2 byes so little chance to see Norwood play in June. If Port can’t improve by July, there is another % boosting chance to win at Alberton on July 1. It is one week at a time of course but looking like a few easy ones ahead. Thanks RB, you nailed it. After a boozie wine lunch I wandered down to the Parade for my first SANFL game of the year. Life has gotten in the way of local footy for me so far this year. What a game. The cohesion of the linking of defence to attack was super impressive. It was enjoyable to warch LJ to play with purpose although i believe he’s been at it all year. Glenn was a class above…how good was he?!! Grigg, could he go back to back? 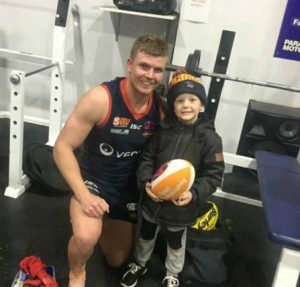 Finally, Will Abbott, the AFL have poached more senior type players from local leagues recently, I wonder how many more Will Abbotts are around playing in comps that with the right environment would make it in the sanfl? All played well. Norwood are certainly one of the teams to beat this season (along with North). Kudos for mentioning that the Dogs’ next opponent is the Power reserves side and not the Port Adelaide Magpies. Didn’t get there on Friday night, Rulebook, thanks to junior footy commitments but watched the replay on the digital streaming. That first quarter was just phenomenal, Redlegs running the ball out of the centre at will. It’s hard to place the last two weeks of footy because the opposition has just looked so feeble but perhaps that’s as well as they were allowed to play (a boy can dream). Great to see Smart and Joffa getting back to some of their best form and Brady is coming good after a slow start to the season. Nunn seems to be improving week on week, too. Would be interesting to know how far ahead in the Magarey Mitch Grigg is, too. Belief is building again, long may it continue. Mitch Grigg destroyed his tagger and another 6 or 7 doggies in the first qtr dust up! Good to watch Legs! I’m all for this SANFL content ‘Book. Well, I was until this week. ALWAYS A GREAT DAY WHEN WE BEAT THE DOGGIES! And the margin is a nice percentage boost, a few more of those will stand us in good stead at the business end of the season. I’m looking forward to some Saturday afternoon games again as my failing eyesight is not up to night games anymore, so here’s hoping we’re coming into a long winning streak! Great stuff Malcolm, love the Kieran McGuiness reference being said to Butcher. What was the crowd for this game? Well played,Swish,Mark a very important percentage boost which was spoken about afterwards as the dogs had a better percentage than us before the game and yes looking forward to some day games. That was an unbelievable Birthday present! Thank you Redlegs for the past 2 weeks of ball pressure at it’s best! I am starting to feel something special in the air! Ian Brewer (1965) and Neville Roberts (1983) both kicked 10 against Central. Ian Brewer (1966) managed 9, then comes Josh Glenn (2018). Only 4 other players (Roger Woodcock, Michael Aish, Craig Kelly and Scott Carslake) have booted 7. Ian Brewer with 10 in 1965 and Josh Glenn with 8 in 2018 are the only players to kick 8 goals or more against Central at Norwood Oval. Only 6 Norwood players have kicked 8 goals or more in round 8. 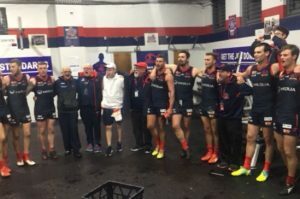 Joshua Glenn – 8 v Central District @ Norwood Oval, 2018. So, Bruce Schultz and Josh Glenn share the record for round 8 at Norwood Oval, both with 8 goals. If you were thinking Friday night’s performance was something special, you were right. There are some legendary names in those lists. Good article, Malcolm, and very interesting goal-kicking stats by Graeme Adams. I hope the boys can keep the winning form going on the other side of the bye.